A work of art built at Middlesex University has been named Best Sculpture at the American Mathematical Society's 2016 Art Exhibition Awards. Designed by American artist and mathematician George Hart, Sword Dancing was constructed in February 2015 at the Middlesex University London campus as a public demonstration of the links between mathematics and art. 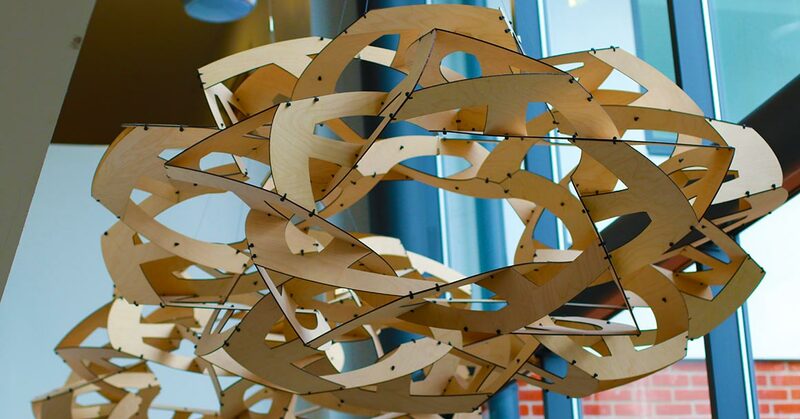 As part of their degree, BSc Mathematics students took part in the construction using wood and cable ties to create the huge structure – which is now on public display in the University's Hatchcroft building. While visiting Middlesex Prof Hart, a Research Professor at Stony Brook University, used a series of sculpture workshops to teach complex mathematics to first year students. "It gave us the opportunity to apply the mathematics learnt in our degree in a more visual and interactive way," said Sabiha Uddin, a student on the maths degree. "It was a pleasure to work with George Hart, it gave us an insight into the breadth of the applications of mathematics." Alex Wiza, who also worked with Prof Hart to build the sculpture, added: "It was an amazing experience. We are very pleased that the sculpture has been awarded this prestigious prize and proud to have been part of its creation." Sword Dancing consists of two congruent but mirror-image orbs, each measuring two meters in diameter. "The sixty components of the design are 'affine equivalent', meaning they can be stretched linearly to become congruent to each other," explained Prof Hart. "They lie in groups of three in twenty planes - the planes of a regular icosahedron which had been compressed by a factor of 1/2 along a five-fold axis."